The ultra-compact direct thermal LP 2824-Z™ bar code label printer brings powerful performance to applications requiring a space-saving printer and media widths of 2.2 inches or less. 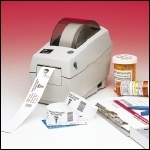 The LP 2824-Z integrates easily into a variety of printing applications, including retail point of sale, retail product marking, shelf labeling, inventory and asset management, healthcare specimen labeling, patient tracking, and pharmacy/prescription labeling. Model 282Z-21100-0001, 203 DPI, 4 IPS Print Speed, 8MB DRAM, 4MB Flash, Serial, USB, US Plug, ZPL Language. Discontinued - Call for replacement. Model 282Z-21101-0001, 203 DPI, 4 IPS Print Speed, 8MB DRAM, 4MB Flash, Dispenser, Serial, USB, US Plug, ZPL Language. Discontinued - Call for replacement. Model 282Z-21200-0001, 203 DPI, 4 IPS Print Speed, 8MB DRAM, 4MB Flash, Parallel, US Plug, ZPL Language. Discontinued - Call for replacement. Model 282Z-21201-0001, 203 DPI, 4 IPS Print Speed, 8MB DRAM, 4MB Flash, Dispenser, Parallel, US Plug, ZPL Language. Discontinued - Call for replacement. Model 282Z-21400-0001, 203 DPI, 4 IPS Print Speed, 8MB DRAM, 4MB Flash, Serial, 10Base-T Prt Server, US Plug, ZPL Language. Discontinued - Call for replacement. Model 282Z-21401-0001, 203 DPI, 4 IPS Print Speed, 8MB DRAM, 4MB Flash, Dispenser, Serial, 10Base-T Prt Server, US Plug, ZPL Language. Discontinued - Call for replacement.